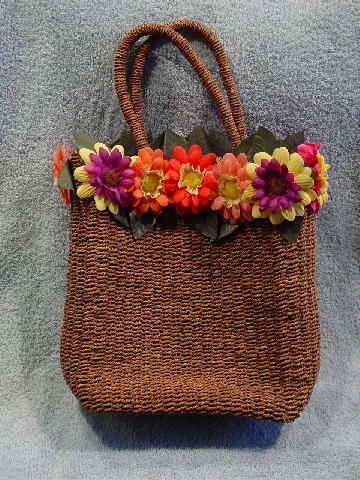 This pliable natural straw woven purse is in a light brown color. It has twelve flowers around the top rim (5 on each side and 1 on each end). 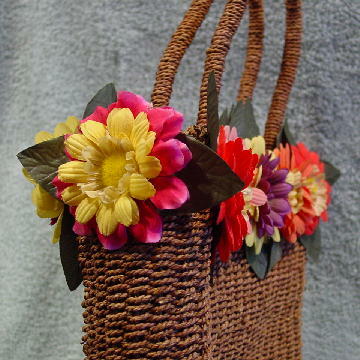 The flowers are in sunshine yellow, pink, magenta, purple, cherry-pink, and coral-peach, with dark green leaves. It has a brown fabric lining with one open interior pocket. It was used as a prop in several swimwear catalogue photo shoots. A few of the flowers were lost in transit, so Eden replaced them with identical vintage flowers from her collection of supplies.